How big will my mini pig get? Potbelly Pigs will continue to grow and fill out up to 5 yrs old. Although there is no magic formula to determine what size your pig will get to - the average potbelly will range in weight from 75-250 lbs and usually stand about 24 inches tall. All pigs, regardless of the breed, start out the same size, so don't be fooled by a small or large piglet - their growth at a young age is determined by how much nutrition they are getting while nursing. Do I have to spay/neuter my pig? Pigs need to be altered for many different reasons - the most important one being their health. Intact pigs will develop any number of serious illnesses and infections which usually result in much riskier and dangerous surgeries later in life. Equally important - intact pigs DON'T MAKE GOOD PETS. It causes aggression, potty training accidents, behavioral problems, and unpredictable pets when left unaltered. In addition to the ever growing pig epidemic in our country - it is imperative all pigs be spayed and neutered at a young age to keep the surgery safer and the cost much lower. (if you're looking for a good pig experienced vet in your area, please contact us with your location and we will get back to you with qualified veterinarians). Is there such a thing as a micro mini, teacup, nano, or pocket pig? NO! NO! NO! There is no such thing as this unrealistic size expectation put upon these animals. 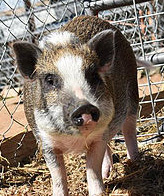 A Mini Pig (Potbelly) IS the smaller version of their farm pig cousins. These horrible names given by breeders to get you to believe them - is nothing more then a deceitful way to con you out of money. Please educate yourself in the average size of a mini pig and don't be fooled by these lies. It is very likely you will be taught how to starve your pig in order to keep it small - it's also a way to make sure your pig dies a painful death long before he/she should. What do I feed my pig and how much? Pigs should be on a commercialized mini pig pellet diet, along with plenty of water to keep him/her from becoming dehydrated. The particular brand isn't as important as making sure your pig is getting adequate portions without over doing it. Many pig owners like to give a salad of fresh veggies and greens for one meal. Keep snacks to a minimum and never let food control your pig. You can always ask your vet or pig community what you should start with based on your pigs size, weight, activity level, age and just overall structure and frame. Why is my pig's skin so dry? Pigs have naturally dry skin that gives them a certain protection against the elements. Bathing them and using soaps and lotions very rarely fixes the problem. Taking an old medium bristle brush and giving him/her a good brush down a few times a week goes a really long way at helping the skin look better and the hair far shinier. How do I find a good vet for my pig? Please understand that not all veterinarians that see pigs are experienced and knowledgeable enough to get the job done well. Make sure you are doing your due diligence and asking fellow pig parents where they go with their pigs and ask the hard questions of your vet to make sure you're entrusting the proper person to care for your pig. When it's something beyond just a simple procedure, make sure to get a second opinion just like you would for your family member on two legs.